New research published today (Friday 27th June 2014) in the journal Nature Scientific Reports has provided a major new theory on the cause of the ice age that covered large parts of the Northern Hemisphere 2.6 million years ago. The study, co-authored by Dr Thomas Stevens, from the Department of Geography at Royal Holloway, University of London, found a previously unknown mechanism by which the joining of North and South America changed the salinity of the Pacific Ocean and caused major ice sheet growth across the Northern Hemisphere. The change in salinity encouraged sea ice to form which in turn created a change in wind patterns, leading to intensified monsoons. These provided moisture that caused an increase in snowfall and the growth of major ice sheets, some of which reached 3km thick. 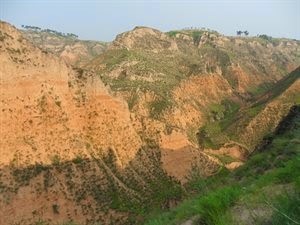 The team of researchers analysed deposits of wind-blown dust called red clay that accumulated between six million and two and a half million years ago in north central China, adjacent to the Tibetan plateau, and used them to reconstruct changing monsoon precipitation and temperature. "Until now, the cause of the Quaternary ice age had been a hotly debated topic", said Dr Stevens. "Our findings suggest a significant link between ice sheet growth, the monsoon and the closing of the Panama Seaway, as North and South America drifted closer together. This provides us with a major new theory on the origins of the ice age, and ultimately our current climate system." Surprisingly, the researchers found there was a strengthening of the monsoon during global cooling, instead of the intense rainfall normally associated with warmer climates. Dr Stevens added: "This led us to discover a previously unknown interaction between plate tectonic movements in the Americas and dramatic changes in global temperature. The intensified monsoons created a positive feedback cycle, promoting more global cooling, more sea ice and even stronger precipitation, culminating in the spread of huge glaciers across the Northern Hemisphere."